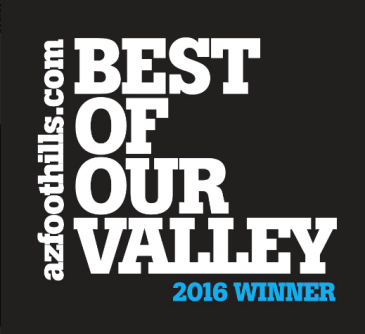 The Desert Mountain Tennis Center is an exceptional facility, recognized as one of the best in the nation. It is called “The Wimbledon of the West”. The Tennis Center is situated at the Sonoran Clubhouse and covers 10 acres. It features 9 USTA certified courts including a beautiful stadium grass court, five clay har-tru courts, and three hard courts. It is very rare for a tennis center to offer play on all 3 court surfaces within the same facility. This is especially true in Arizona. Each court has its own pergola with misters for comfortable year-round play. Members can enjoy superb playing conditions and programs for all ages and abilities. The Tennis Center has won numerous awards over the years, including ‘Court of the Year Award’ from Tennis Industry Magazine, and ‘Outstanding Tennis Facility Award’ from the U.S. Tennis Court & Track Builder Association. For more information about tennis at Desert Mountain, download a copy of the Tennis Brochure. There is a wide cross-section of tennis players of every level including men, women and juniors. Whether you desire a social or competitive experience there is something for you. Desert Mountain hosts a variety of tournaments and social events throughout the year. Special events include the Mixed Double Social, Tennis & BBQ and the Club Championship. There are numerous clinics, leagues and other special events designed to satisfy every level of play. The staff also provides private or group instruction upon request. Put the enjoyment back into your game with personal instruction, tennis lessons or clinics by the USTPA certified tennis pros. 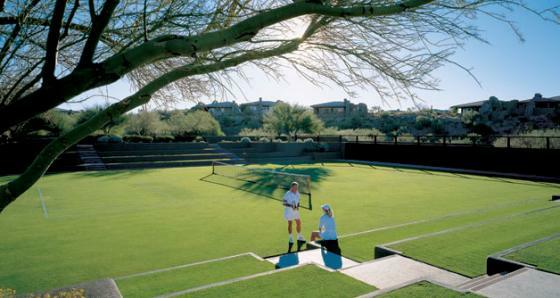 Grass Court – The stadium grass court at Desert Mountain is also called the ‘Wimbledon of the West’. It is aesthetically a wonderful centerpiece for the Sonoran clubhouse. The grass court was designed with a full water heating system built under the court to provide ideal growing conditions for the grass. It is one of the finest conditioned grass courts in the world. 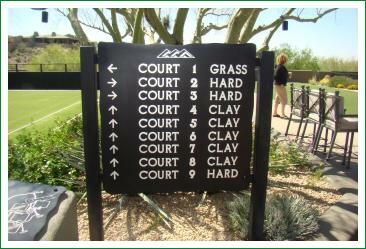 Clay Courts – Desert Mountain has five clay Har-Tru courts. These are distinctive green-gray courts, similar to those found on the East Coast. They are quite different from the red clay courts found in Europe, the Northeast and some parts of the Texas. 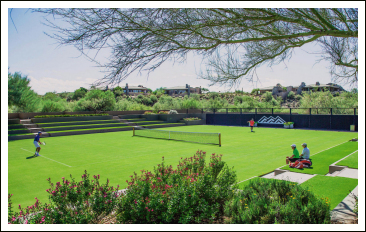 The clay courts at Desert Mountain provide a softer playing surface and are extremely popular with members. They use a Hydro Court system which is essentially a clay tennis court on top of a controlled water reservoir. The water level is completely level under the court, allowing evaporation and capillary action to provide water to the playing surface evenly. The system provides an excellent playing surface. Hard Courts – There are three two-toned green on green hard courts at Desert Mountain. The courts are very modern with a cushion based rubber inlay. This provides a more forgiving, player friendly feel. Traditionally, most leagues in the western half of the United States have used hard courts. Ladies Tennis – At the social level, Women’s Open Play is twice a week for players of all levels. This is held on the clay courts and is a doubles round robin format. If additional players are needed to make the numbers even, Desert Mountain’s tennis pros will participate in open play. For more competitive players, Women’s Advanced Open Play is held on Saturday mornings. This program is more competitive than the weekday groups. Levels in this group range from 4.0-5.0. This is also a round robin format and is held on the hard courts. Tennis Team League Play for ladies is available at 3.5, 4.0, 4.5 and 5.0 levels. Currently, Desert Mountain currently has 5 teams that compete in matches at others clubs in Scottsdale & Phoenix. This league is very flexible and members can play as often as they like. The Desert Mountain Ladies Day Team Event is held twice a year at the beginning and end of the season. This tournament brings together all of the league teams in a competitive spirit. There are many Ladies Clinics to choose from depending on your skill level. Afternoon clinic are help throughout the season for the 3.5-4.0 and 4.0-4.5 players. Morning clinics are held before and after the season for the 5.0 team drill. Junior Tennis – Junior players at Desert Mountain can participate in lessons, camps and clinics designed just for them. Tennis lessons are offered every Saturday morning. Summer and holiday camps are also offered for Junior players. All levels are welcome. Players are paired by age and ability. After school clinics are designed for young players who want to compete at the high school or college level. Men’s Tennis – Men’s Open Play is 3 days per week for players of all skill levels. It is a doubles round robin format with three rounds. If needed, the tennis pros will participate to make the numbers even. Mixed Tennis – There is a monthly tennis social for men and women from September-May. It is a mixed doubles, revolving partner format and is a great opportunity to meet other members. 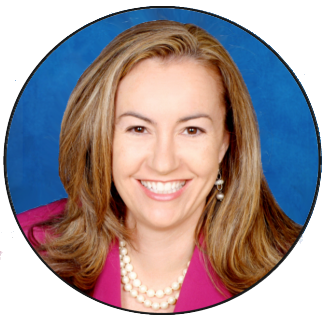 Carmen Brodeur is a top Realtor specializing in Scottsdale country clubs. She is very knowledgeable about the premiere tennis clubs in Scottsdale. Carmen would be pleased to explain the differences in the tennis facilities and memberships at the other clubs in Scottsdale. 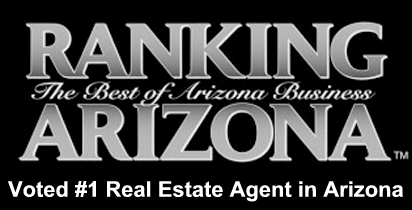 Contact her for more information about any Scottsdale real estate.